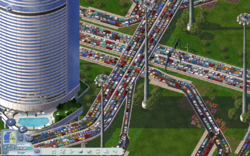 Traffic generators are known to cause heavy congestion, but won't affect the game's traffic simulator. 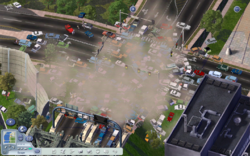 Traffic generators can also cause epic chaos. A Traffic Generator is a ploppable lot that continuously spawns car traffic a few tiles around it. If a traffic generator is placed directly next to a road network, it can become clogged with traffic. The traffic generated does not impact the traffic simulator, and will not intervene with commute times. The amount of traffic generated from a traffic generator can vary, because some lots generate small amounts and others medium and heavy. Multiple use of heavy traffic generators in one area can lead to total gridlock on the road systems and sometimes crashes. This page was last modified on 18 October 2013, at 02:01.